Invectors has a technical team with high expertise in the field of drug delivery with a special focus on the use of peptides as targeting vectors for liposomes, or other aggregates, filled with drugs for targeted and personalized diagnosis and therapy. We specialize in a range of formulation and drug delivery technologies, from conventional liposomes, Stealth (PEGylated) liposomes for drug delivery, slow release liposomes to solubility enhancing systems such as microemulsions and liposomes. We have strong and broad expertise in the drug delivery field with a special focus on the use of peptides as targeting tool for selective delivery of drugs or contrast agents. Invectors highly qualified staff accounts experienced people from Pharmaceutical Industry and from Academia as well. Invectors partnerships at University of Naples provide expertise and knowledge in the area of Drug Delivery in general and particularly in delivery technologies based on bioactive peptides. In the last few years, Invectors has also invested in proprietary R&D projects based on its know-how, in many areas of peptide application, becoming a fully technology-based company. 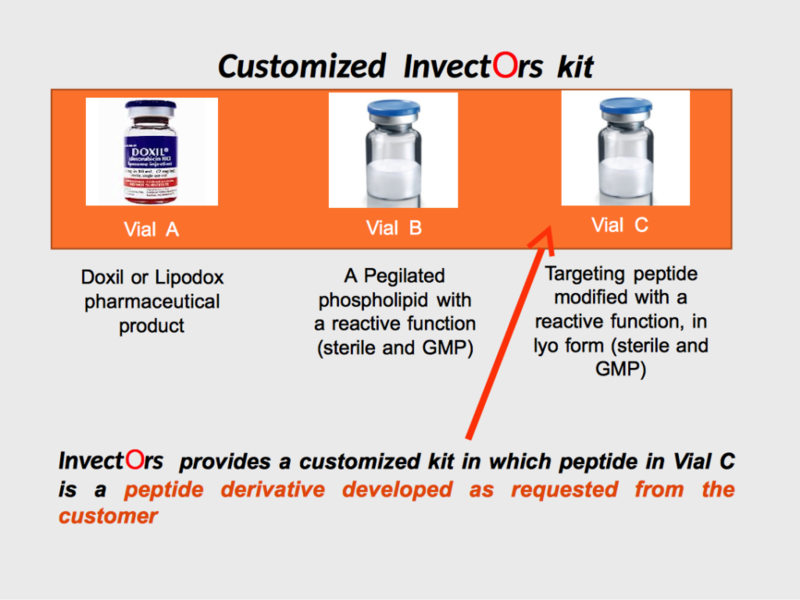 Very important, Invectors develops and provides customized kits in which a peptide derivative, developed according customer needs, is used to drive liposomal drugs on target cells in a selective way.